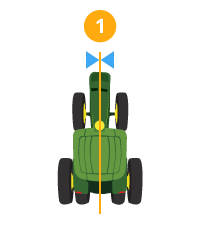 Measures lateral distance (left or right) from center line of machine to center of GPS receiver. 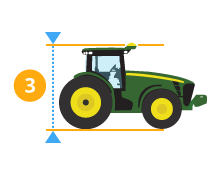 This value should be set to 0.0 unless GPS receiver is offset left or right of center line of machine. To input a measurement other than 0.0, Left or Right must be selected. 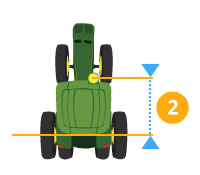 Measures inline distance from center of non-steering axle on machine to center of GPS receiver. Measures vertical distance from GPS receiver to ground. Measure from top of green portion of GPS receiver to ground.